It still seems hard for me to believe (and an installment about this in Irwin's Journal Online is forthcoming), but with preparation, patience and a lot of help, I ran what was my second 5K, a distance of five kilometers or about 3.1 miles. 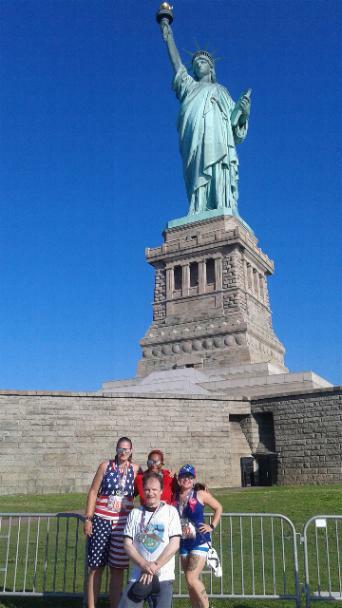 The Statue of Liberty 5K is really a special event; it is a fundraiser for Special Olympics New Jersey and it literally takes place on Liberty Island early in the morning of July 4. 2016 was the third year for this and it's growing every year. Here are a few photos from that morning. How early on July 4 was it? Check-in began at 5:30AM! Which means I was up at 4:30AM! On a holiday? Was I crazy? Well, yes, I suppose. 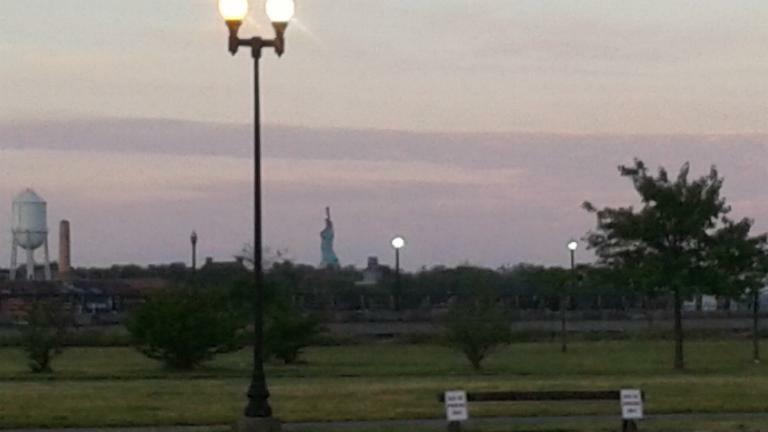 This was the view from the check-in area at Liberty State Park in Jersey City, New Jersey... my home town. The photo was taken just five minutes after the official sunrise. 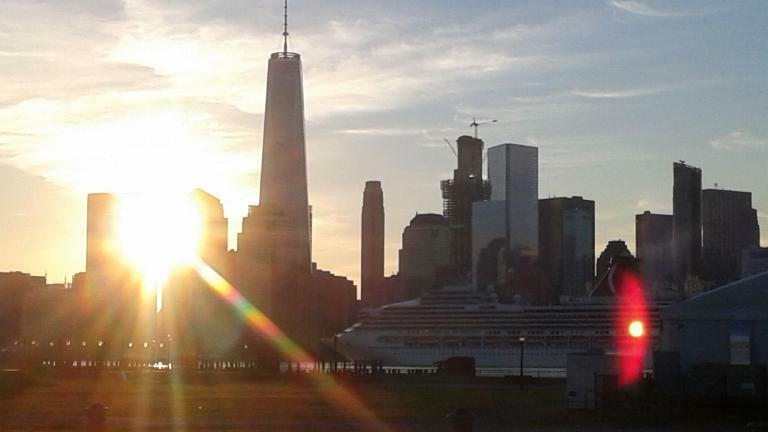 It took me a while to figure out the source of the red "dot" on the cruise ship as it headed up the Hudson River past Lower Manhattan... it was the strong sunrise bouncing off my cell phone! Before I forget, all of the photos on this page were taken with my smartphone's camera, something else that I find hard to believe. 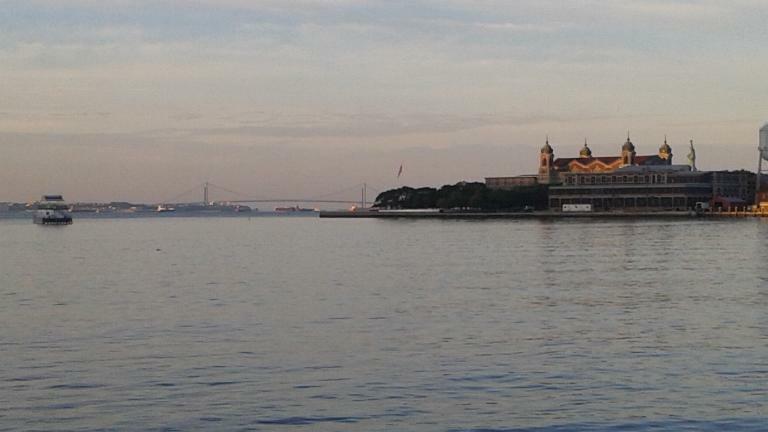 "The dawn's early light" hits the Verrazano-Narrows Bridge and Ellis Island as the first ferry trip takes the volunteers and equipment over to Liberty Island. The partipants went a little later. 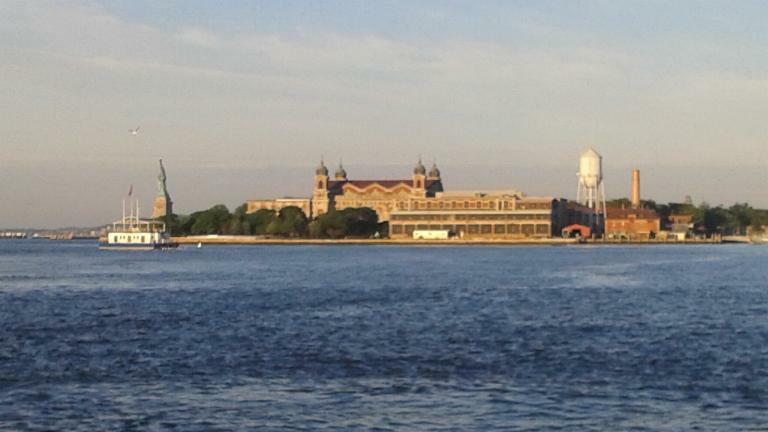 Both of my maternal grandparents came over from Poland and passed through Ellis Island on their way to Jersey City. Turning around, I'm standing on a barge that serves as the dock for the Liberty Island Ferry from the "Jersey" side as I take this. I was wondering why I was moving up and down so much... and hoping I didn't get seasick before boarding! 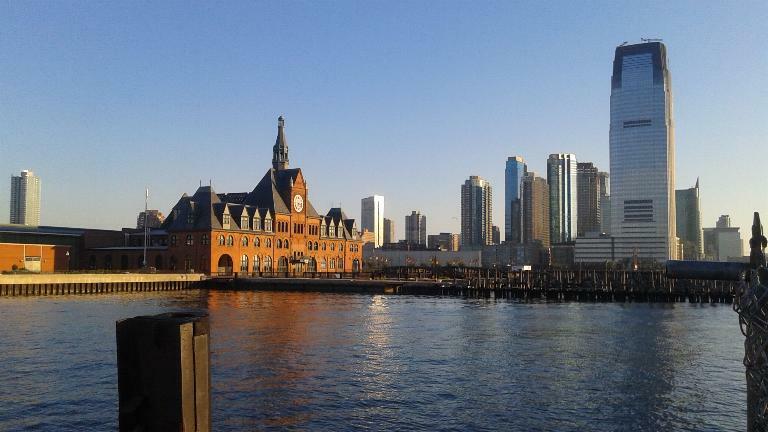 Anyway, on the left is the restored headhouse of the Central Railroad of New Jersey's main passenger train terminal and ferry landing point. Trains from as far as Atlantic City, Philadelphia, Washington and Scranton, Pennsylvania once called here, although the vast majority of service was for commuters in the "bedroom communities" of the State of New Jersey until May, 1967. This building was once the centerpiece of a massive railroad terminal that spread over hundreds of acres, and, other than the terminal and train shed, is now completely gone. 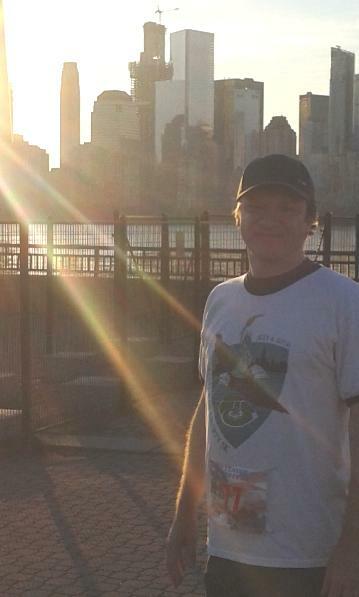 In the background are the Exchange Place and Newport Centre areas of Jersey City that look nothing like it did when I was a young child growing up near there. It still blows people's minds when I tell them that on the site of a major hotel I once swung from a freight car while my dad took pictures. My ancestors would never recognize this place! I STILL DO NOT LIKE SELFIES!!! And there she is in all her glory. 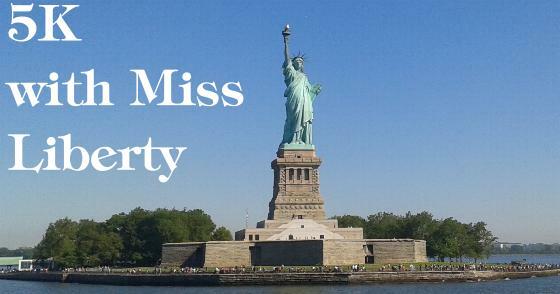 The National Park Service opened the island early for the event, and Statue Cruises donated the round trip transportation for everyone involved. 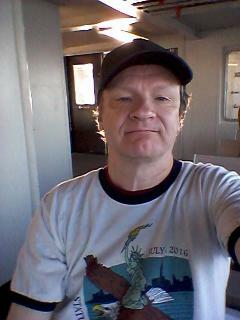 Participants could stay on Liberty Island for as long as they wanted afterwards, or head over to Ellis Island. Had I planned a little better I might have taken more advantage of that, but my aim was to focus on the 5K, run it, and finish it! After the race. It was not really competitive in the sense of a "usual" 5K, more of what's known as a "fun run" although there was a timer set up at the finish line. 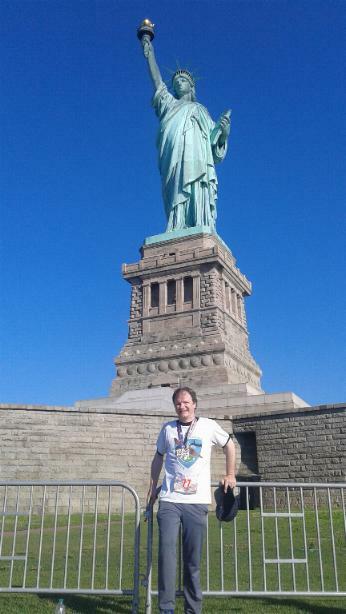 What could be more fun than seven laps around the island, passing right in front of the Statue of Liberty each time? I completed the run, mostly running with some walk breaks, in an "unofficial" time of 32 minutes 43 seconds. Everyone who finished received a medal! I'm wearing mine in this shot. Here I am with some of the more than three hundred (!) other participants; we all talked about the race before and afterwards and everyone was snapping pictures of each other using mostly smartphone cameras. We're all going to try to make it back for next year's running... and see who else we can get to come along. And as you can see, it couldn't have been a more beautiful day at the Statue. 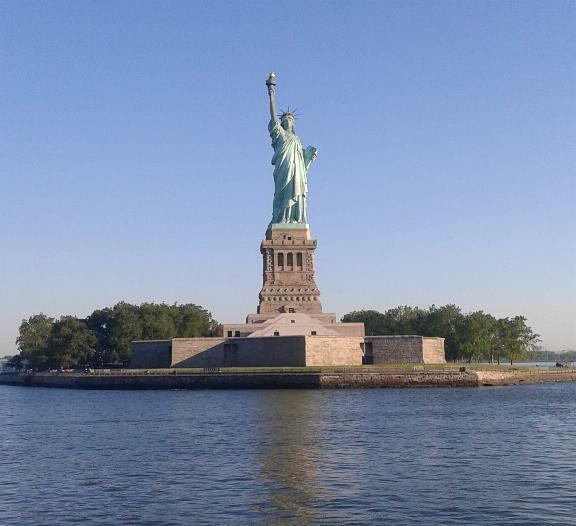 And as a final incentive to think about... opening Liberty Island early to runners on what is traditionally the busiest day of the year at the Statue definitely is an advantage to participants! 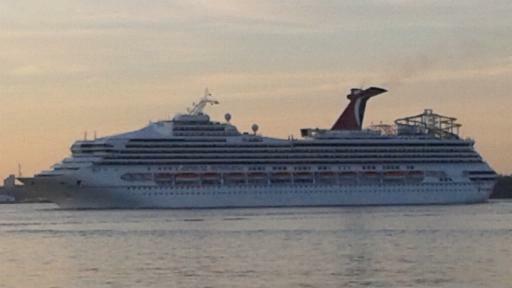 This first official boat from Manhattan, arriving 90 minutes after the start of the 5K, looks like it's going to tip over! Sorry, folks, I'm still beating you to the gift shop!